you know this: You have guests invited to dinner, do not want to risk that they will not be fed and cooked too much. Just as a cooking novice mine is happens very often and we had several days of feed residues, or occasionally landed food in the garbage. Over the years I have learned to estimate the amounts more or to cook dishes that can be frozen without loss of quality. In this context, I have also discovered the chain cooking for me. Here it comes to cooking certain ingredients conscious in larger amounts, and then process them on successive days that followed, and thus save time. typical example cooking potatoes, because it takes a long time to complete. The better plan my meals has helped me over the years, to drastically reduce the amount of food that end up in the garbage. In today's judgment you can use pasta leftovers from the previous day and process them into a frittata. 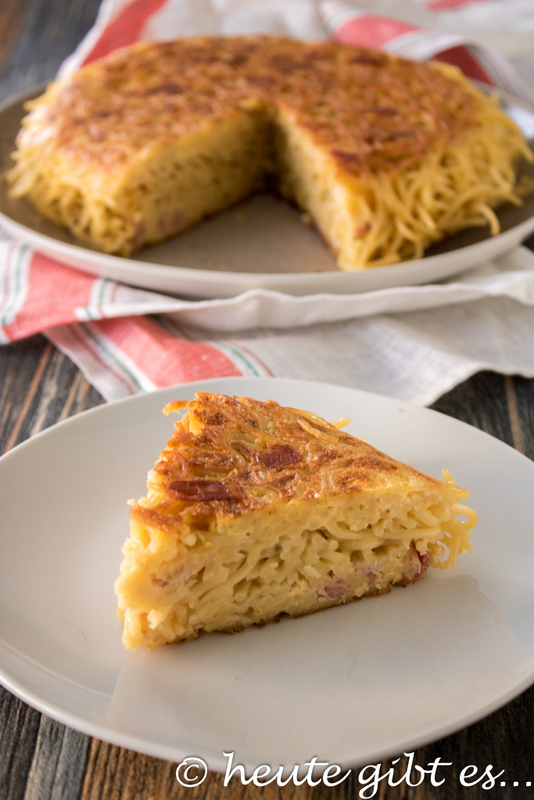 A frittata is an Italian omelet, similar to the Spanish tortilla. There are thousands of varieties and is perfect for the recycling of residues. 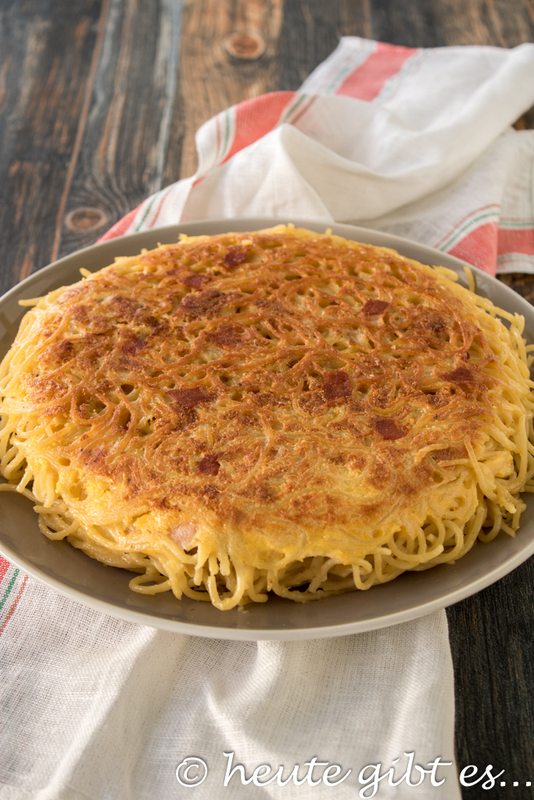 Typically in Italy is the spaghetti frittata, a dish of the postwar period, prepared today, if spaghetti left from the day before. 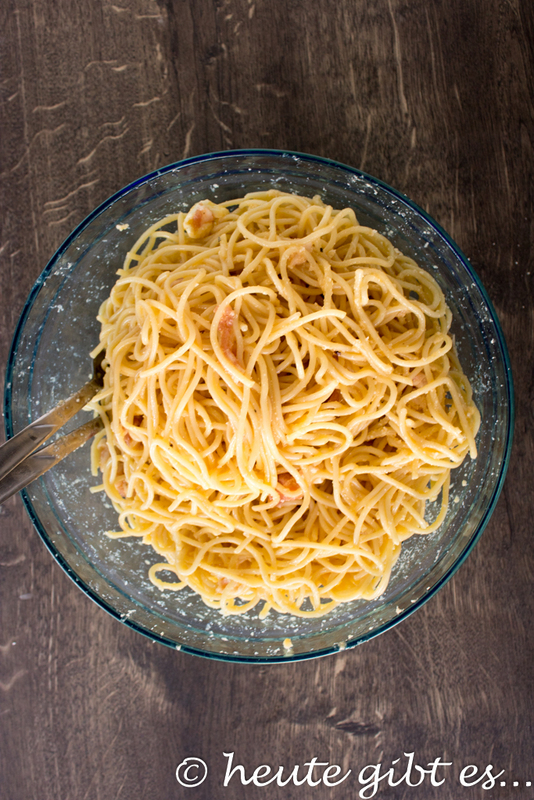 Of course you can boil fresh pasta in this dish, but it need not do so because the quality is the same. 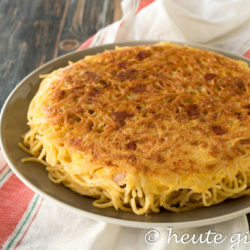 Since the frittata di spaghetti is typical in many regions, but still quite unknown in Germany dish from Italy, this fits in my opinion perfect for “The culinary world tour” by Volker. This is a blogger action that brings us every month to a different country in the world. Here, a typical meal to be cooked or baked then, so you can even expand his horizons. I love to experiment in the kitchen and cook privately also like dishes from other countries. 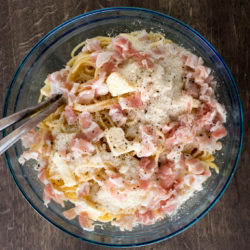 Since the trip but quasi starts in my home, I did not want to be missing just today, even if its on my blog already some Recipes from the Italian cuisine place. 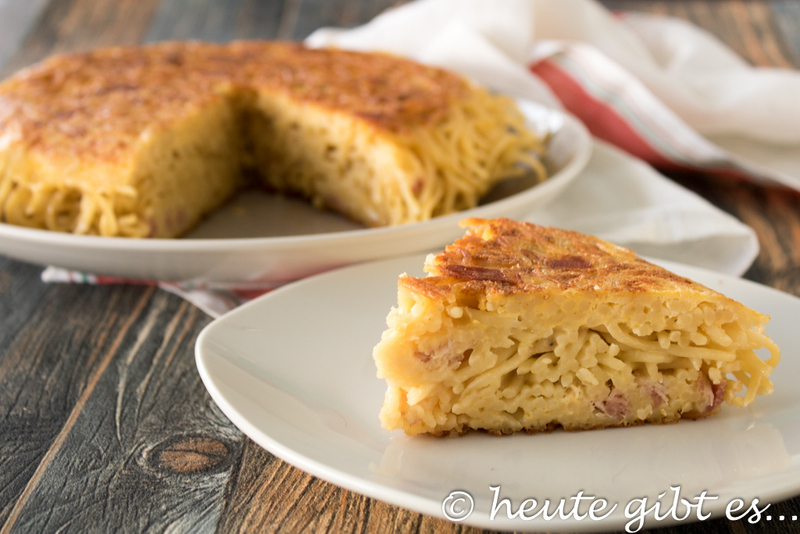 For the frittata I have decided, therefore, because I wanted to imagine not a traditional recipe, but something rather unknown, but tastes most people and especially children. The great thing here is that it is a typical “refrigerator court” , i.e. you can depending on what you have used to vary the recipe and adapt it to your own taste. Just in the refrigerator Incidentally, the noodles may – it need not necessarily be so Spaghetti – be already mixed with the sauce. So, if you have something Bolognese Sauce left you, you can also add this, the court has a tomatigen taste. You see, the possibilities are endless! My recipe is a very simple version and will therefore serve you only as a stimulus to understand the principle behind the preparation of the court. 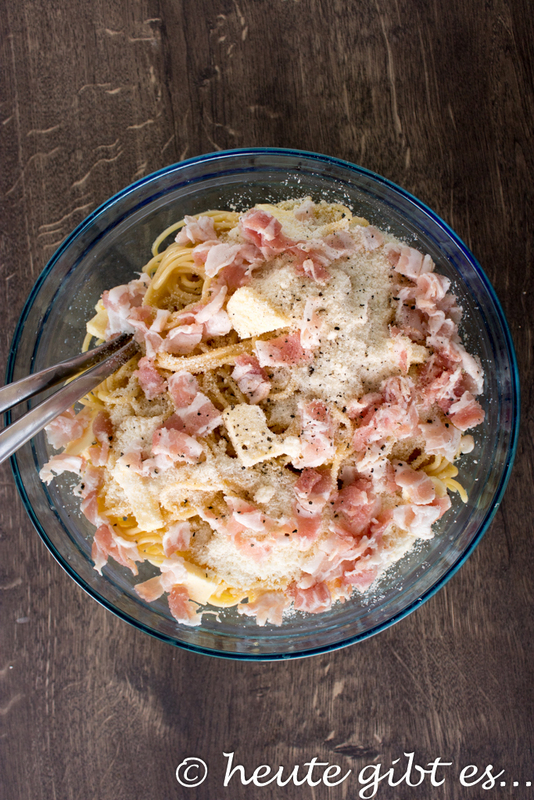 Taste this version is reminiscent of the classic Spaghetti alla carbonara. 100g bacon, ham o. Ä. 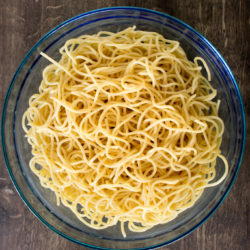 The pasta al dente and drain. 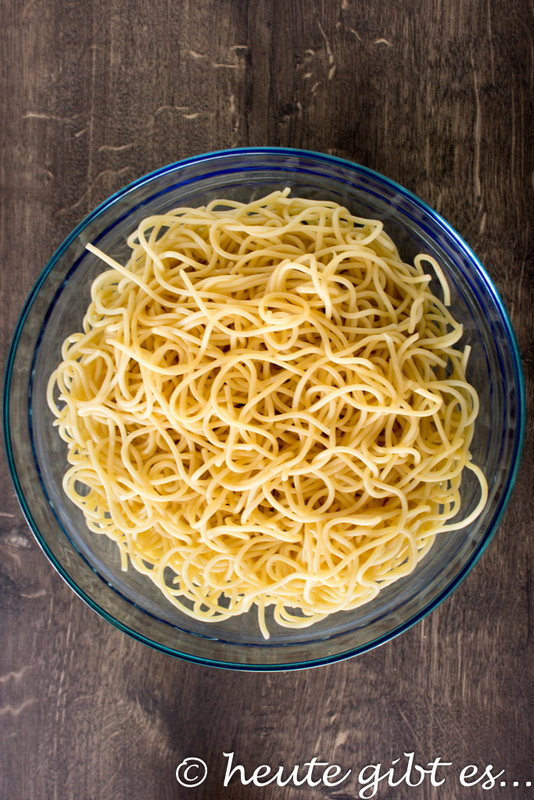 If these add a little milk from the previous day and mix thoroughly so that the spaghetti not stick together. The eggs add and mix well with two forks. Now the cheese, which cut into small pieces of butter, add the diced bacon, salt and pepper and mix well again with the forks. 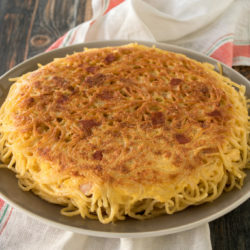 In a pan (diameter 22-24cm) give a dash of olive oil and heat. Then the pasta filling into the pan and fry over medium heat until it has an even, golden brown color on the bottom and is crisp. This can verify her by her slightly lift the frittata in the margin. After that overthrow the frittata onto a flat plate, in turn, heat a drizzle of olive oil in a pan and fry the whole thing from the other side. 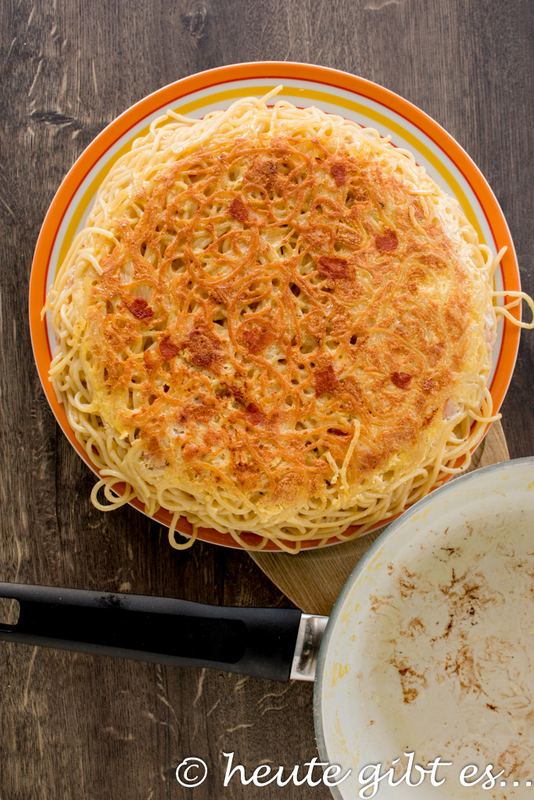 Here, just leave the Spaghetti omelet slip into the pan. 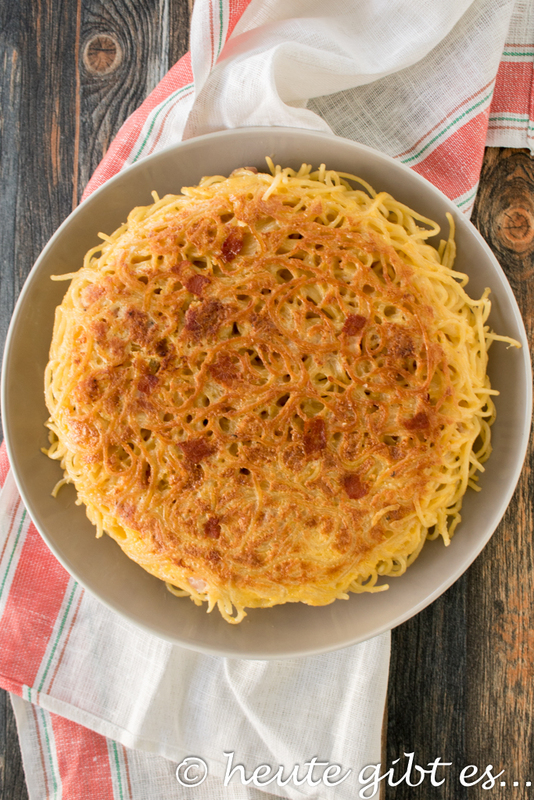 Once the spaghetti frittata is golden brown crust and from the other side, it is ready to be served. 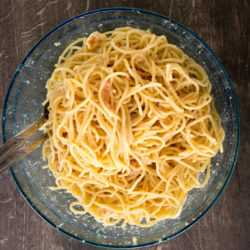 Instead Spaghetti other types of pasta can be used of course. 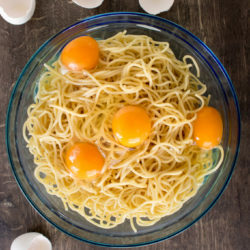 When pasta like fusilli I would still schedule an egg in addition as otherwise there is a risk that the noodles do not stick together. 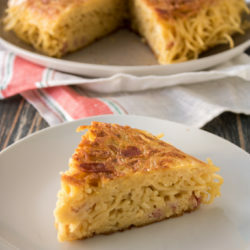 The frittata can be eaten either hot, or cold, and holds about 1-2 days. 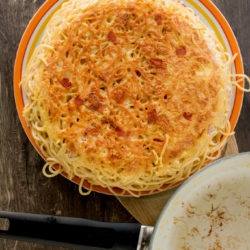 If you like the ingredients can vary, use another cheese, add vegetables or use pasta with tomato sauce. The main difficulty in this dish is probably when falling the frittata, but this is not a great work of art. You see, a perfect dish for any cooking beginners! Just because you miscalculated in everyday life anyway with the noodle amounts and can then use these the next day for some other goodies. Fancy bread, pizza and Co? Fancy a tasty side dish? 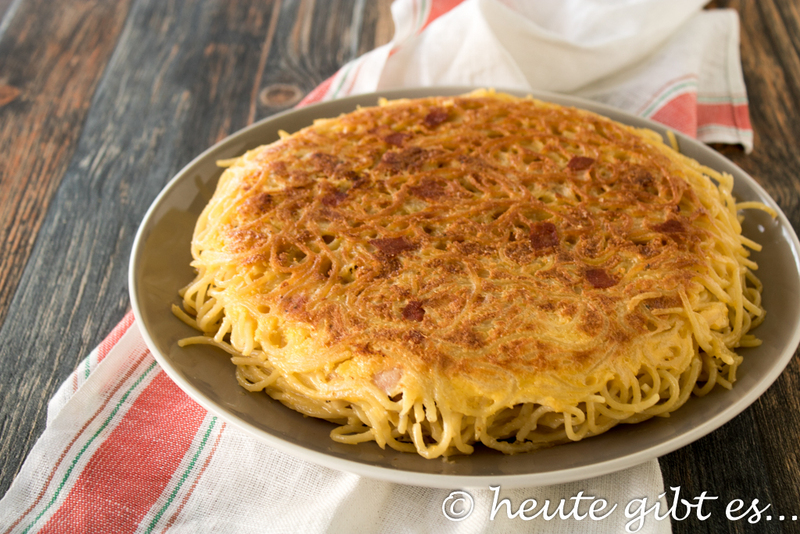 12 Kommentare zu "Frittata di spaghetti – a tasty leftovers for noodles"
For me it is rather the reverse: I verwerte pasta leftovers often so and did not know that there are also this recipe in Italy. 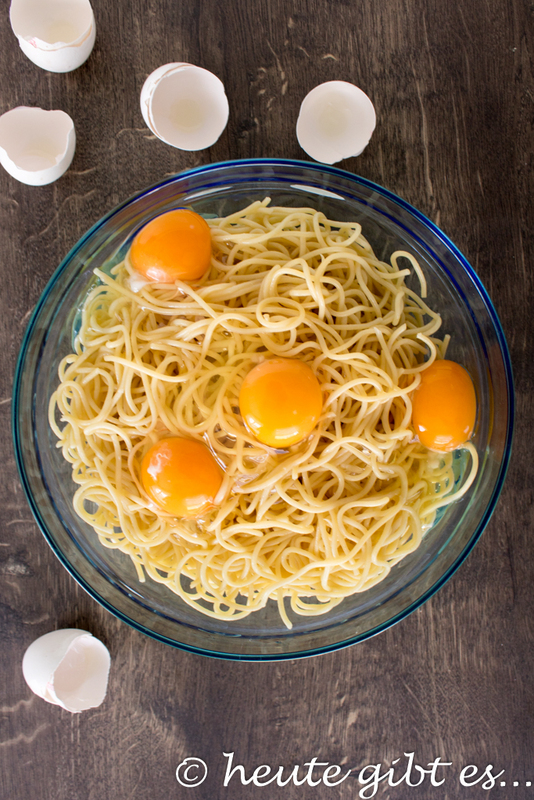 😀 but I fry until the noodles in butter a little crispy, salts them there and then pour in the beaten eggs. Then I'll handle the heat strongly down, put a lid on and leave the top usually only falter. In addition there is often herb yogurt. your approach is certainly going well. But since we love the Crispy on the outside so bad, we fry them well from both sides. With us, there is nothing to it but will try it with the herb yogurt. We often cook more potatoes, rice, pasta or other side dishes, as required for a meal and use the remains as creative as possible. 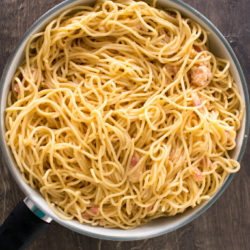 Spaghetti remains my favorite! Aufgebrate. 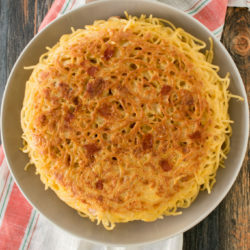 Therefore your spaghetti frittata recipe fits me well in the stuff. 🙂 tasting I made! Refried is definitely a tasty alternative. The advantage of the frittata is probably mainly to cold also tastes good because it pervades really nice. I'm curious how it tastes good! 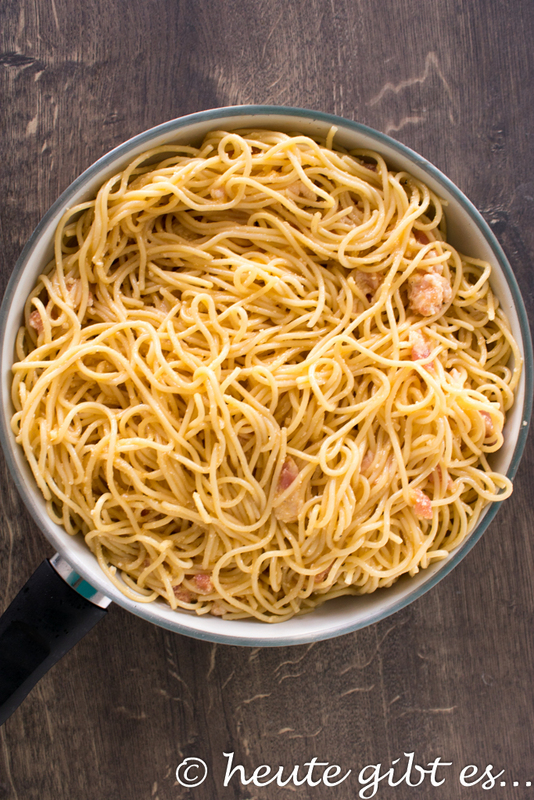 This is a great recipe, easy, and certainly mega delicious. I have it saved me and I will give it a try! 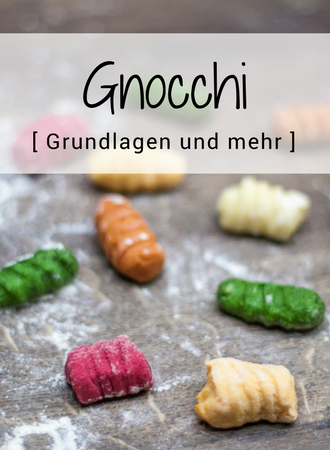 we do not every day, but very often Pasta 😉 Hope the recipe meets your taste!